County Auditor: Benton County, Minnesota; 18?? to 1??? County Government: Benton County, Minnesota (Register of Deeds); 18?? to 1??? He came to Minnesota in 1854. 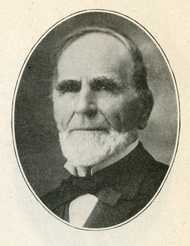 He moved to Sauk Rapids, Benton County, Minnesota on May 1, 1855. He moved to St. Cloud, Minnesota in 1861. He was an unsuccessful candidate for the Republican Party endorsement for Minnesota Governor in the 1886 and 1888 elections. Leadership Notes: He resigned from the Minnesota Legislature on January 9, 1880. Session Notes: He became Minnesota's Lieutenant Governor on January 10, 1880. "Hon. C.A. Gilman." Memoirs of the State Officers; and of the Nineteenth Legislature of Minnesota, by C.L. Hall. Minneapolis: Johnson & Smith, p. 37. C. A. (Charles Andrew) Gilman. Biographical Information from the Minnesota Historical Society's Governors of Minnesota.